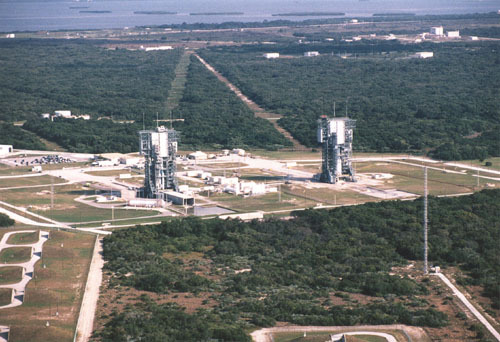 This is an aerial view of Complex 17, with Pad B on the left, and Pad A on the right. Behind the gantries (at the extreme top of the photo) is the Banana River, which is roughly west of us. You will notice that the gantries are gray in this photo, but red in the previous one (both were repainted in 1996). In 1997, Pad B was modified to support the newer, more powerful Delta III. Sadly, the Delta III's inaugural flight on August 26, 1998 ended with the vehicle exploding shortly after liftoff. If you look closely in the larger version of this photo, you can see that both pads are currently servicing Delta II rockets. If you follow the cleared paths leading toward the Banana River from Pads A and B, you will see that they join in a cleared field. This is the press viewing area. The white building at the left side of the field is the Mercury Control Center. The contents of the Mercury Control Center building have been relocated to Kennedy Space Center. Joe Marino/Aerospace Reports Photographic Services. Joe is a staff photographer for the National Space Society.